Maintaining balance contributes to better movement and staying independent, particularly for the elderly. It prevents accidents while allowing people to move faster through possessing control of their weight and body. Numerous causes are blamed for impaired balance. It may come with age, like in the case of elderly people. Other individuals, although younger in age, suffer from balance problems due to injuries, ear problems, orthopedic conditions, and others. Fortunately, several exercises aid in restoring balance, which are simple to do. Nevertheless, those suffering from orthopedic-related issues need to consult experts before conducting any exercise or acquire recommended training routines tailored for the orthopedic problems. Stand with legs apart to distribute weight equally on both feet. 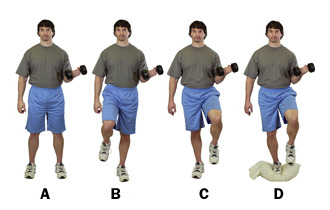 Gradually shift weight to one side of your body and lift the opposite leg. Maintain proper posture while staying in position for around 30 seconds. Return to the initial position and do the same position for the other leg. Do this procedure several times until balance improves. Increase routine intensity by increasing the number of repetitions once you can stand on one foot faster and longer. Do the same initial position as weight shifts. 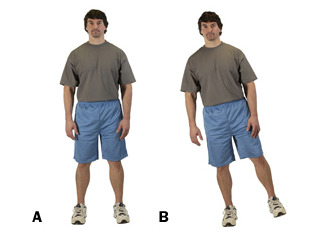 Put hands on your waist and lift a leg, either left or right first, and bend it towards the back. Stay in position for up to 30 seconds and return to the first position. Do the same and improve intensity once you are comfortable with the routine. Try similar positions for variation. For instance, extend the lifted leg without touching the ground instead of bending. Another variety is to step on a pillow instead of the flat, solid ground for a more challenging routine. Follow the same first position in the first routine. Grab a dumbbell with one hand and lift it upwards until your palm faces upward and at the same level as your elbow. Lift a leg and bend it backwards. Stay in the position for 30 seconds while maintaining proper posture. Return to the initial position and repeat the procedure for the other leg. Similarly with single-leg balance, make the routine more challenging by lifting the weights on the other hand and balancing with the opposite leg or standing on an unstable surface. Start by standing in the same position as the first exercises. This time, lift a lighter weight above your head and with your elbow at the same level as your shoulder. Your palm should be facing forward. Lift a leg and bend. Hold still in the position for 30 seconds. Return to the first position and do the same steps with the other leg. Increase the number of repetitions once comfortable with the routine. 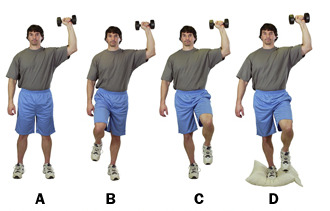 Variation also applies by following the challenges added on the biceps curls exercise. This routine follows the same procedures mentioned above. 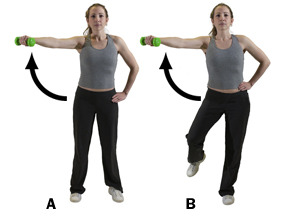 The difference is lifting the weights towards the side with arms extended at the shoulder level. On this position, lift a leg and bend it back. Return to the first position after 30 seconds and do the same steps using the other leg. Apply the same variations for enhanced intensity. Vision directly affects balance together with the proprioceptive systems and inner ear. Looking at a focal point ensures balance and keeps the body from falling. Closing your eyes while doing this exercise adds a challenge that improves your gait. Start the routine by standing at ease while maintaining proper posture. Close your eyes while keeping your body still. Make sure to do this activity on the solid ground at the beginning of the training. At this point, you may feel balancing your body slightly challenging. In time, however, your body will get used to it. This time, try doing single-leg exercises without opening your eyes. Through training, you will notice that it is easier to do the routines even without your vision. This routine enhances balance by letting the body move in tight spaces like a narrow flooring or tight rope. Walking on actual tight space is unnecessary in this exercise. 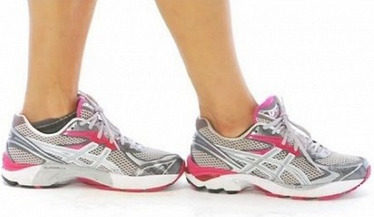 You simply need to limit the space in between your feet while walking to promote better a gait. Place a foot right in front of the other. The heel of the foot should touch other’s toe. You may feel unstable balance right at the start of the procedure. Continue by walking in this manner for several steps, but make sure you do this in a room where you can grab on to something in case you lose your balance. Enhanced balance is not only attainable through standing exercises. A Ball circle is a proven effective routine in promoting improved gait that will help you in your movements. Get a stability or an exercise ball and sit on it while keeping good posture. Back and shoulders should be straight at all times while doing this routine. Put your hands on your nape, leading to a position where your elbows point towards the sides. Keep your feet flat on the floor to help you retain your current balance. In this position, start moving your hips as if you are making small circle patterns. Start with smaller circles and then increase their size once comfortable in doing the routine. Do 20 circles clockwise then another 20 counterclockwise. Wall squats follow the same initial positions in single-leg exercises. Lean to the ball and bend your knees like doing squat exercises. Ensure that your knees remain at its position as you squat. Return to the first position by pushing your body against the ball as you go up.